“Well, you can tell it’s the Easter weekend, there are all sorts of foreign tourists jogging past in designer running gear.” My man sighs. Yes, the holiday season is upon us and the atmosphere in the Chianti countryside changes completely. As we drive along the Strada Bianca (white road, better described as very dusty gravelly dirty track) We try not to shower the unsuspecting runners with a cloud of dust, which is almost impossible. They all end up the same colour, despite their various shades of day-glow! But never mind, they all wave and smile, after all, they are on holiday. 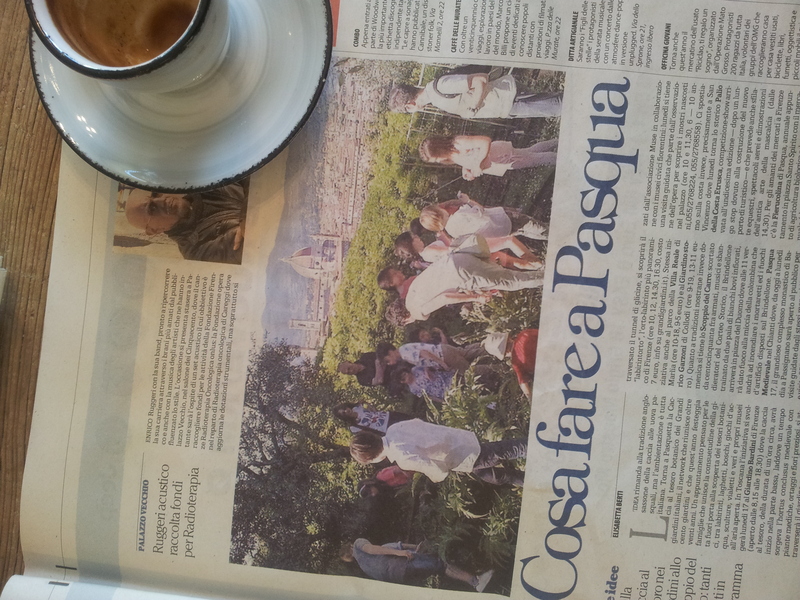 Here in Tuscany, like most other western countries, the children are off on their Easter Egg Hunts. Il Solferino caffè bar in Certaldo this morning, rang with calls of ‘Auguri,’ which is short for ‘Best Wishes,’ a greeting used on all Festa Days. The town was wrapped in a chilly cloud of mist and gloomy tourists traipsed around wondering why everything was closed on a festive weekend. Silvio and little Lamb. La Repubblica. OK, what next? Ah yes, bless him Silvio Berlusconi has been photographed cuddling and bottle feeding a lamb, which has been saved from the Easter roast. Apparently, he, Silvio, became vegetarian last year so he definitely has my vote if he stands for parliament again. I know, a candidate needs greater qualifications than lamb saving, but I can’t think of any politician with any. So this has ticked one box for me. ‘English’ park bench under ‘Italian’ Ash Tree. Photo J Finnigan. 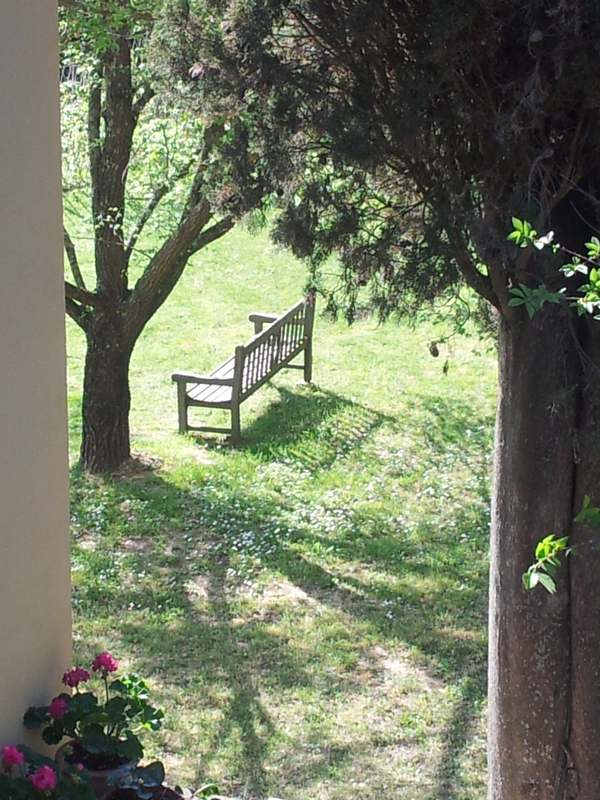 Well enough you may say, and anyway it’s time to pop down to our ‘English’ park bench, which is nicely placed under our ‘Tuscan’ Ash tree for an aperitivo before our Easter lunch. If any restaurants are open today they will be packed. From experience, we have learned to stay at home on Festa days. Can’t help but feeling sorry for those tourists again when they find eighty percent of places closed and no free tables in the remaining restaurants! So, salute, Cin Cin, Bottoms up and cheers to you all. 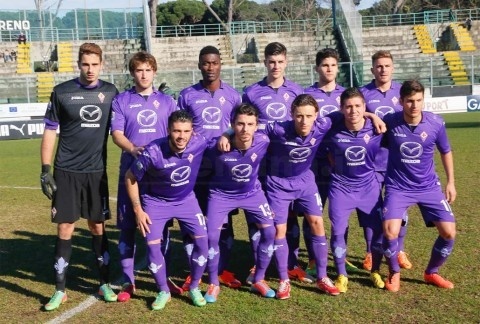 Fiorentina in strange crouching position. Easter morning in our local village of Fiano and like every other self-respecting Italian, Laura has closed her bar/alimentari for the Festa. So we repair to the other bar, Caffe La Piazzetta, in the piazza where it is sunny enough to sit outside and watch the world go by. The village was very quiet, even subdued, then the man reminded me that the Fiorentina (Florence) football team lost their match the day before. The football results always affects the mood in the village. Later, over lunch at ‘C’era Una Volta’ in Lucardo, the ristorante is full. Paolo had saved us our favourite corner spot so that we could people watch again. “Gosh, look over there, the last time I saw an outfit like that it was worn by a member of The Who Band in the early 70’s,” my man hooted. He was right; a beautiful purple trouser suit with flared trousers, black shiny cuban heeled ankle boots and a matching scarf thrown around the neck. Make-up had been carefully applied and the hair was big and sprayed carefully into place. The eighty plus year old Nonna was stunning. “To your left June…” my man was nudging me, “Those two are the Italian version of Absolutely Fabulous!” I tried not to laugh out loud, as he was spot on again. Patsy and friend (please remind me of the friend’s name) were posturing two tables down to my left. Hair and faces were almost identical to the TV stars and the clothes were so seventies. I was starting to really enjoy myself. 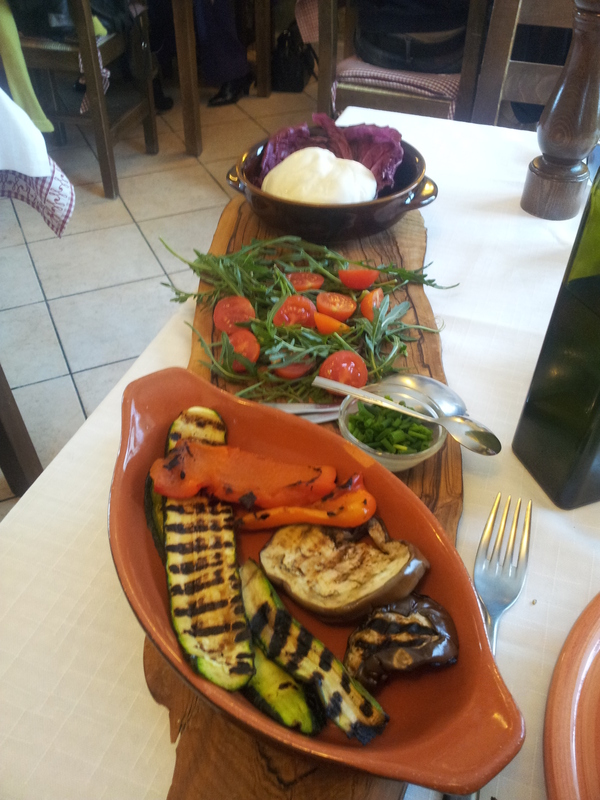 I dug into my wonderful dish of Buratta con verdure Grilliate and sighed with contentment. Earlier, over cocktails in Montespertoli, we had spotted a thirty something male with a pony tail in silver lame suit and black silk scarf, several smart jacketed ladies in tight jeans, leopard skin stilettos and matching handbags. 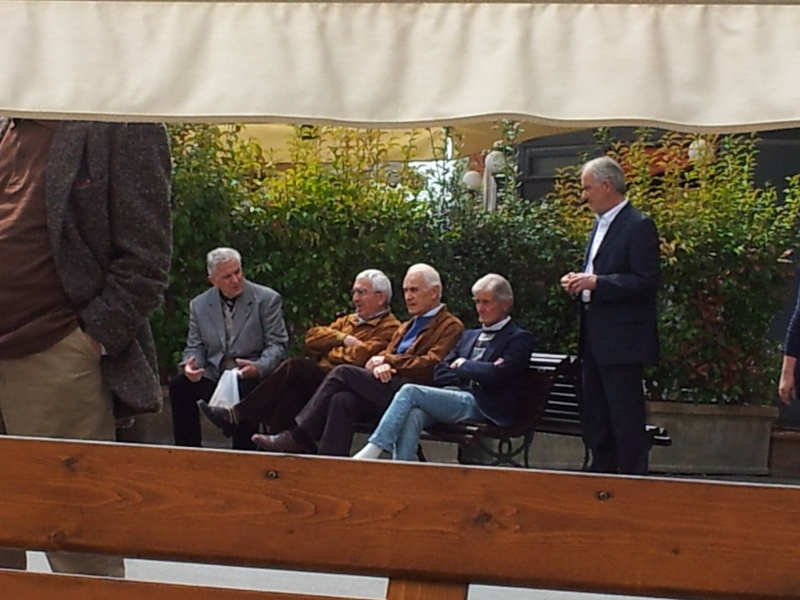 And the Crew-Cut Family, all ladies and three generations walking in twos, arms linked with matching black crew-cuts. The parade from church is always fascinating. Easter Monday, the family invaded and our granddaughter stayed on for two nights. The grandson was recovering from a bout of asthma, so went home with Mum and Dad. He is fine now. My Man went to London on the Tuesday so my beautiful nine-year old granddaughter and I, had some quality girls time and far too much chocolate! Oh dio, Silvio has gaffed again. SB has provoked outrage, in suggesting that Germany did not acknowledge the existence of World War Two concentration camps! Some say it was a swipe at his old foe Martin Schulz, the German president of the European Parliament and the centre-left candidate to lead the EU Commission. The two previously came head to head in 2003. SB said that his own centre-right party would pick up around 20 percent support in the up and coming elections in May. SB claimed that his original comments in 2003 were not meant to be insulting, suggesting that MS might like a part in a film, thinking of ‘Hogan’s Heros’ and the part of the stupid guard, Sergeant Schultz! He had thought MS would have been flattered…….! Oh Dio……. My apologies for the lateness of this post, but I have been battling with a really lousy internet connection…. My man left for London on the Monday morning and the doorbell rang in the afternoon. I hung out the bathroom window, which is above the main gate, and thought ‘Wow, one gorgeous man leaves, then two arrive and, my god, one of them is clutching my novel! Both men are Italian, tall, wearing Armani suits and hand-made shoes. “Buona Sera Signora, We have come to invite you to a meeting in Certaldo on Monday.” I am flushed with delight. “A book signing?” I gush. “Err, well, a book reading actually, are you interested?” Well this all sounds too good to be true, so to check that I am hearing correctly, I ask if they speak English. The tallest one smiles, flashing his perfect teeth. He takes the book from under his arm and holds it up. Hang on a minute, that is not my book, it’s a wedge of orange leaflets. “Please to come to a memorial for Jesus Christ.” “Jesus Christ!” I echo. “Yes, Signora, we will be reading err, book of Mormon…” He opens a leaflet and shows a picture of Jesus looking very American and I swallow my disappointment. “Oh, how nice, pop it in the post box beside you,” I say gracefully. Would my week get better I wondered? Hurrah, brightly wrapped Easter eggs adorn the shelves at Laura’s Bar/Alimentari in Fiano, and there are two lotteries to buy tickets for. I would not want any of the prizes that range from a huge box containing a tea & coffee set with fruity lemon designs, to a water filter, Easter Cake and Eggs. Alessandro our rotund friend and local sports paper reader, has displayed some ‘attractive’ glass vases and a roulette set on a separate table, as he is representing the lottery for the local football club. So, naturally, I buy tickets for both. As you can imagine, there is a huge following for the Easter Celebrations in Italy and Pope Francis has already been performing in Roma. He is so hands on with the people, that I expect to see him ascend towards heaven and then do a belly flop into the crowd like a rock singer! A clutch of Italian men, one with olive branch. In Montespertoli on Sunday, the congregation poured out of church carrying olive branches, which is traditional here. Those wanting to be a little less obvious, had them sticking out of their pockets and handbags; some of the women did too. Wisteria over the car port. New flowery arrivals this week have included masses of wild red poppies in the hedgerows. 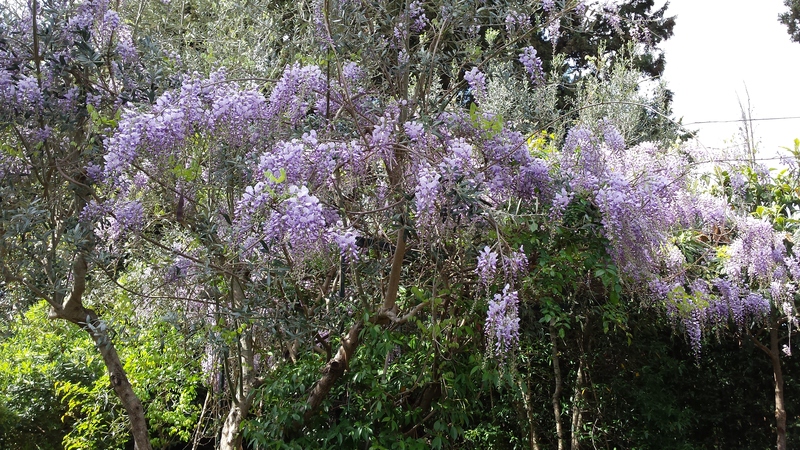 In the garden Wisteria, Jasmin and Night Scented Stocks fill the warm air with heady perfume. One could almost get drunk, breathing it in! My man returned on the Friday and the next day we are enjoying coffee in Fiano, reading Il Terreno, which is a better newspaper than Il Nazione. 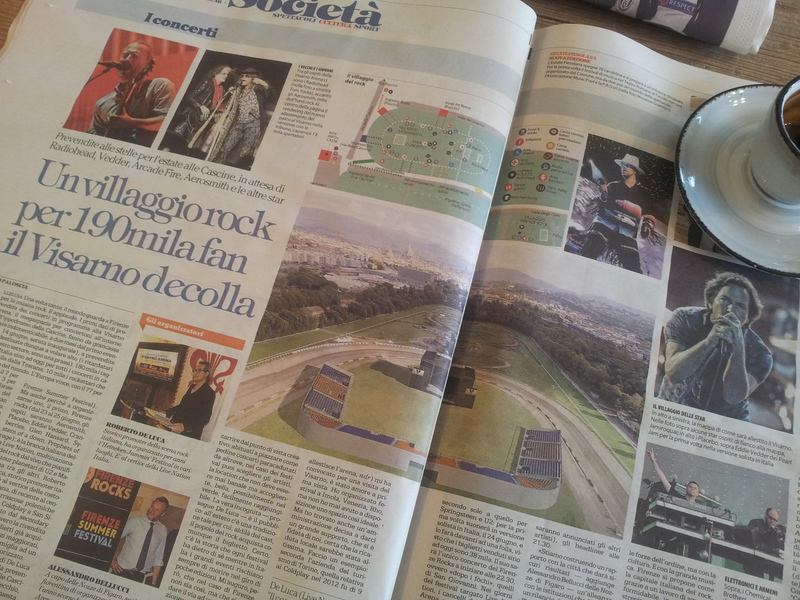 However, I do quite like the reporting on visiting Bands and theatre in the back of the latter. Suddenly, I am roaring with laughter! 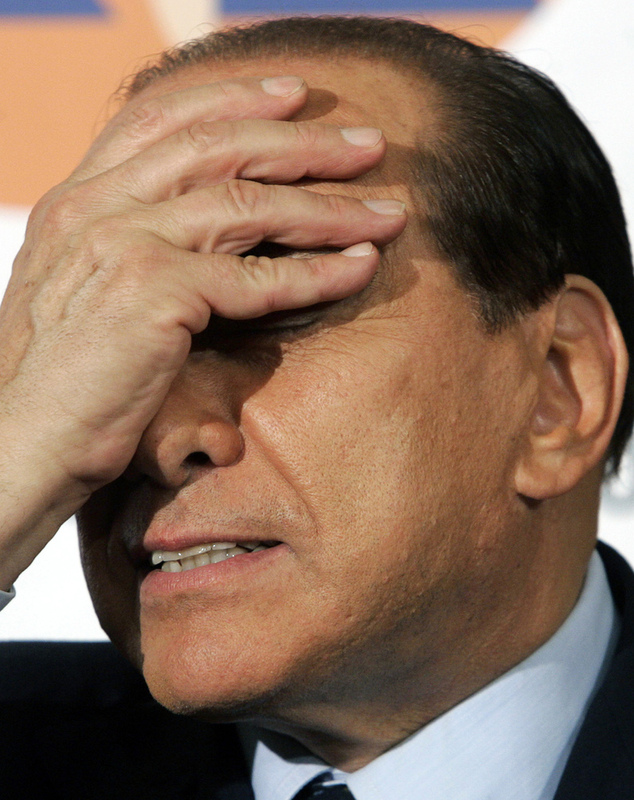 Only in an Italian newspaper will you see a photo of Silvio Berlusconi clutching his…..well, vital bits! I show the picture to Laura and Benedetta who laugh and say, that all Italian men do that when they are feeling insecure. At the age of seventy-six, SB obviously still has something worth clutching, so that’s in his favour…. 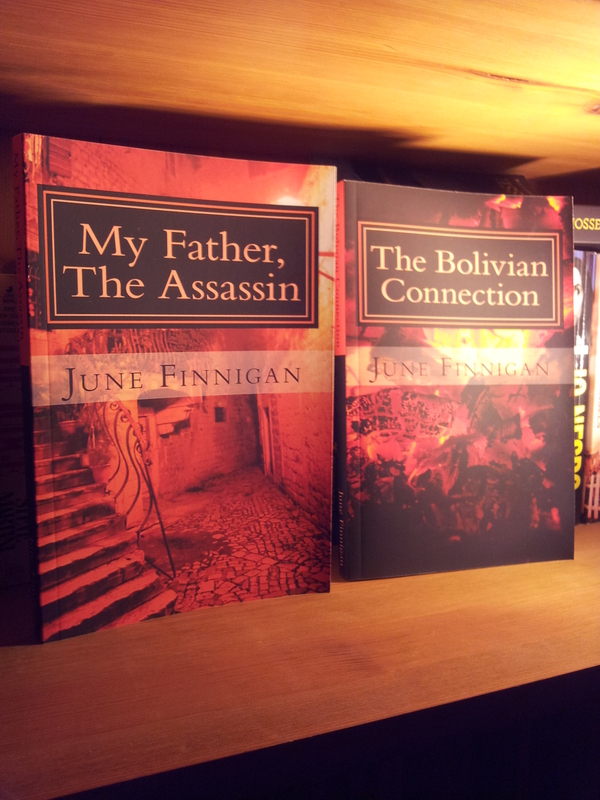 Meanwhile, I forge on with the ‘Bolivian Connection’ and three more chapters are under my belt. Farty Barty is very happy with life and the grandchildren will be here for an overnight stay on Easter Monday. So a double dose of chocolaty Easter celebrations for them. Ok, must finish here, as the day job is calling.